Complete your Apple setup with a pair of Apple headphones. Featuring the latest Apple AirPods, our range of Mac-compatible headphones showcases premium audio performance and the elegant, user-friendly design you’ve come to expect from Apple. With its latest headphones Apple have delivered effortless compatibility with all your Apple devices and an array of smart new features. Boasting wireless performance, the latest AirPod headphones offer a smooth hands-free experience that’s further enhanced by seamless Siri integration. 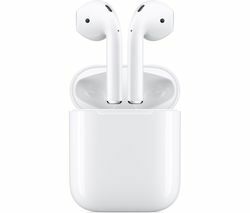 A simple double-tap on either AirPod activates Siri so you can make calls, switch songs or playlists, adjust the volume or ask for directions. Even if you’re already familiar with Siri, Apple’s intelligent personal assistant, AirPod Apple headphones enhance the experience, taking the hands-free experience to the next level. 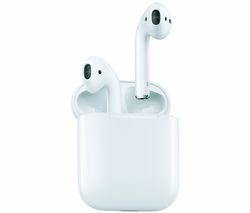 There’s no need to worry about the longevity of these wireless headphones, one charge of your AirPods provides up to five hours listening time, and if you're caught short a quick 15 minute charge will give you three more hours of enjoyment. Apple is renowned for the effortless compatibility of its devices and the AirPod headphones are no different. You're not just limited to your iPhone with the Apple AirPods - they can even connect to Apple Watch, iPad and Mac. All you need is an iCloud account and these ingenious Apple headphones will instantly switch between devices. Our complete headphones collection includes all the latest models from leading audio brands. Check out our selection of Skullcandy headphones and view our range of Audio Technica headphones to explore a variety of in-ear and over-ear headphones to suit every budget and lifestyle.